Open banking and payments: fascinating times ahead! You have definitely heard of open banking, a pan-European initiative that is forcing banks to create APIs for other technology companies to integrate and build on top of. The majority of the spotlight has been shone on the ability of other companies to access our bank accounts via these secure APIs. But what you might not have heard of is the payment opportunity that is going to be created from the new regulation. We sat down with Ben Wakeham, co-founder and CEO of Pollen Technologies, one of the first companies to be regulated for these new payment permissions. He believes that the fundamental changes in the payment model will benefit both the payer and the payee, with the opportunity stretching to both consumer payments and (the much larger, but much less innovated in) business payments space. And the market insight so far would seem to agree, with estimates for payment via open banking to hit £300 billion of transactional volume by 2020. Prices for online card payment acceptance have now become so high (+3%) that some merchants had even begun adding it on as a separate fee at checkout. This is due to the number of middlemen taking a slice of the transaction (issuers, processors, gateways, acquirers). 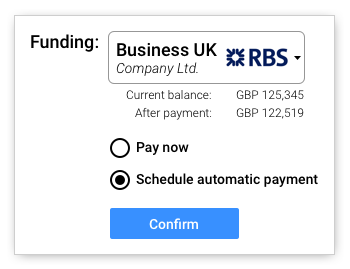 With open banking, payments run on the Faster Payment network, with banks not allowed to charge any different to what they do now, which is nothing. Meaning companies like Pollen are not only looking to dramatically undercut the existing card payment providers, but even potentially not charge for the payment at all, monetising other data-led opportunities instead. And with the payment surcharging ban now in effect, it is of even more importance for businesses to watch their payment acceptance fees. The existing card payment model involves the creation of a merchant bank account, which is separate to a business’ main bank accounts; and also under the control of their payment service provider, not the business. This is so that any chargebacks and fees can be taken, often meaning businesses don’t get access to their funds for seven or more days. With open banking, funds are delivered directly to the businesses bank account with instant settlement. Yet again removing unnecessary middlemen. The open banking payment model is relevant to both online and physical payments. The concept of secure customer authentication (SCA) is going to affect all forms of digital payment as of September this year, aligning the user experience of both card payments and open banking payments, with the mobile phone becoming the enabler. This is incredibly important with the notion that for something as important as a payment, repeatability creates comfort and trust. At the point of payment a quick additional use of the account information service providers (AISPs) regulation during customer authentication – in real-time or pre-authorised – would enable an instant credit option. The revolutionary part, however, is that there is the potential for a marketplace model, with banks competing in real-time to analyse the data and offer the best price. If Wakeham and his firm are right in their thinking, this would be a fundamental change in not only how payments are made, but also the credit and lending industry. It’s going to be fascinating to see how this plays out over the next few years. Few years are needed for this to become a real alternative because very few banks support Open Bankiing. The end (of the 4 party model) is nigh. What is essential in choosing a platform that meets your long-term strategy and ensures the viability of your bank?